[toc]Diabetes was previously known to be a disease largely prevalent among the aged. However, in recent times, there has been an alarming increase in the number of cases reported. The rising occurrence of diabetes in people who are in their 20s and 30s has the medical world concerned. A nationwide survey conducted by the Journal of American Medical Association has found that 1 in every 3 adults in China is suffering from the disease. Ailments like diabetes miletus cut life expectancy and are often the precursor to other medical conditions like Alzheimer’s, heart disease, lower limb amputation, nerve damage and kidney failure. Given that it progressively weakens the body, it is very important to do everything possible to keep this illness at bay. Most people may exhibit symptoms that are pre-diabetic but are very rarely aware of them.This general lack of awareness has not helped tackle the larger problem which is why various media are attempting to educate the public about the risks associated with the disease. Of the two types of diabetes, type 1 is hereditary and therefore, very little can be done to prevent it. Type 2 however, is preventable to a very large extent. 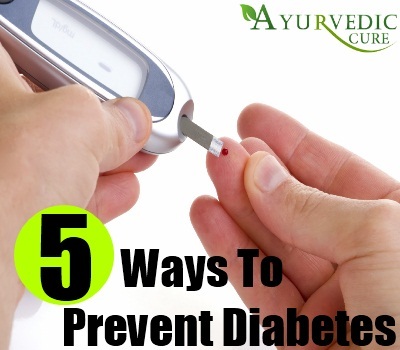 If you are wondering how to prevent diabetes, cutting down on sugar is perhaps the first step. But for the long term, a more holistic approach has to be adopted to avoid it altogether. Recently, there is a surge towards healthier diets and regular fitness regimes which are said to help prevent diabetes. Aside from this, including certain food in your diet can help lower the chances of contracting the condition. Are you slightly overweight with a protruding belly? You may be showing pre-diabetic signs already. It is very important to keep your weight in check. Typically, those who have a BMI (Body Mass Index) over 29 are at a higher risk of getting diabetes. Maintaining your weight is a good way to ensure that your body is healthy and is responding to insulin in the way it should. It is also important to understand that not everybody who is overweight is certain to get diabetes. There is a misguided perception that only overweight people are susceptible to diabetes. Medical experts have long since busted this myth. A slim figure is not always a healthy one. Thin people often have fat stored in the muscles and liver. This often leads to severe insulin resistance and type 2 diabetes. Sitting for hours in front of the T.V. or playing video games on a computer can have long term implications on your health. Children who engage in a sedentary lifestyle are prone to type 2 diabetes when they are older. Even working professionals who spend most of their day sitting in offices at their desks must include exercise in their busy schedules. Limiting the amount of idle time and increasing movement is essential if you want to live a healthy life. Any type of physical activity is good. You can walk, run, jog, swim, dance or skip your way to fitness. You can do a combination of low intensity and high intensity workouts. Exercise for 30-40 minutes at least 4-5 times a week. Diabetes is a disease where the blood sugar levels are abnormally high. 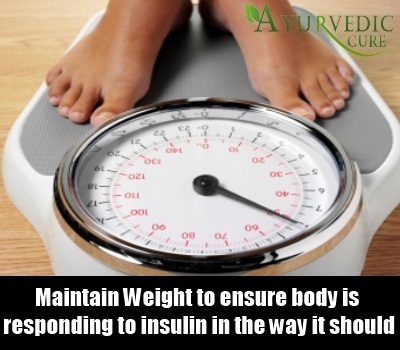 This can be because of a lack of insulin or because the body is not able to properly utilize the insulin. Insulin is the hormone which helps the body absorb glucose from the blood. While it is unclear whether eating too much sugar can cause diabetes directly, it is definitely an indirect cause. When the body fails to use sugar that is stored in the blood, it gets converted into fat. This can lead to obesity in the long run. It has already been established that maintaining a healthy weight is a must to prevent diabetes. Sugary beverages, snacks and foods made out of refined flour are bad in more ways than one. Prolonged consumption of the same have been linked to this debilitating disease and only by limiting or avoiding them can one truly reduce the risk of contracting diabetes. 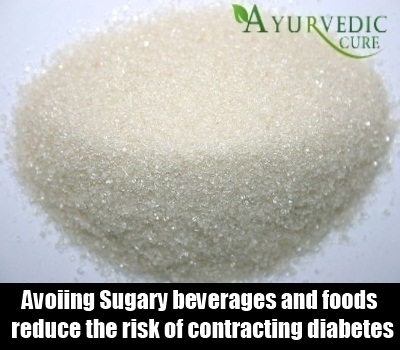 The mentioned foods are not cures but are useful in maintaining normal blood sugar levels. A diet rich in fiber is said to boost blood sugar control and lower the risk of heart disease. When you eat refined rice and wheat, you find yourself feeling hungrier between meals. This may lead to snacking and craving sugary treats. 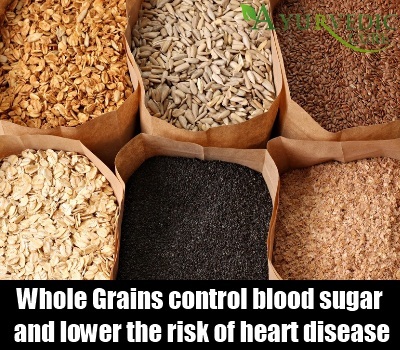 Switch to whole grain foods which contain the nutritious bran that gets discarded during the processing of refined grain. You will feel full and less inclined to snack. In this manner, you are limiting your intake of unnecessary sugar and calories that contribute to weight gain. The fat present in nuts, seeds and avocados are healthy and eating them in moderation can lower the risk of diabetes. For protein, switch to lean meat like poultry and seafood and include low-fat dairy products in place of full fat milk and yogurt. Many of us feel good health begins and ends with the right food and exercise. We fail to realize that a good night’s sleep is very crucial for our body to function normally. Studies have been conducted to analyze the link between sleep deprivation and blood sugar levels. It has been found that people who sleep less often reach for cookies and chips as against people who get the requisite 7-8 hours of sound sleep. It is assumed this is because the hormone cortisol causes abnormalities in blood sugar levels when the body is deprived of sleep. 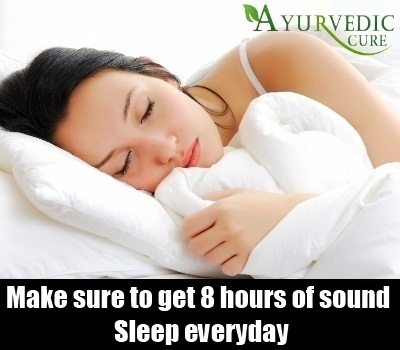 If you want to keep diabetes away, make sure you get 8 hours of sleep everyday. If you have trouble going to sleep, start yourself off on a good bedtime routine and follow it every day. All the suggestions mentioned above work together to produce the desired outcome. Following one or two alone will not help you stay healthy. Diabetes can be prevented by staying aware and building that awareness among the people around you.